Under the Central Park trees in a spot near the west 72nd entrance there is something magical taking place– Boomerang Theatre Company presents William Shakespeare’s “A Midsummer Night’s Dream”. The popular comedy has many interwoven plots but for the most part it follows four Athenian lovers and a group of actors rehearsing for their next production. Hermia (Laura Darrel) is in love with Lysander (Bret Richard Hoskins). However, her father demands that she marry Demetrius (Spencer Scott). Demetrius also loves Hermia but has the undying affection of Helena (Kristin Patton). He does not care for Helena. Lysander and Hermia decide to run off to be with one another and plan to meet in the forest. Hermia informs Helena of this and Helena in turn passes the news to Demetrius. All four end up in the forest where fairies tamper with the love triangles using magical flowers. Interactions between characters are altered causing much chaos. The fairies mess with the actors who find themselves in the forest on the same night. I am more than glad to say that the performers casted in this piece are the corps d’elite of the acting world. They are vibrant and full of energy, professionalism and skill. Kristin Patton’s portrayal of Helena is flawless. Her tone, facial expressions and movements are just perfect. The same goes for Laura Darrell and her execution of Herma–she is such a titan within her field. Speaking of titans, Bret Richard Hoskins commands the role of Lysander with an iron artistic fist. Spencer Scott is a strong force in his own right as Demetrius, matching the high level of the cast. Scott Michael plays the role of the mischievous Puck and my God is he is wonderful. It is clear he is in his zone. Annalisa Loeffler holds her own as Titania, queen of the fairies. Loeffler brings a real regal feel to play. William John Austin also makes his mark as Oberon even though his scenes are not many. Just like Austin, Cassandra Johnstone (Hippolyta) and Caleb Carlson (Theseus) are not present for too long but still their presence is noted. Then there is Vinnie Penna who is able to get that obnoxious laugh out of you because he is just so hilarious. The stage is home. I can rave about the cast all day. I have officially became a fan of them all–that includes Edgar Equia (Snug), Dan Lovely (Snout), Jeff Burchfield (Starveling), R. David Robinson (Quince), Uriel Menson (Egeus) and Miles Butler (Flute). The choice to use nature as the setting and not build a stage is genius. However, the location does come packaged with its hiccups. I applaud the cast for being able to stay in character through civilians literally walking across their stage, crying babies and police sirens. What is strange about all this is the fact that these bumps only add to the overall NYC ambiance of the show. John Greenleaf is a director to keep an eye on. 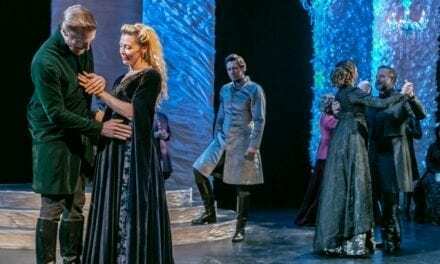 Bringing Shakespeare to life in a park without a stage which has exit wings and curtains is an intimating and difficult task but Greenleaf pulls it off. He manages to use more of the space than you would believe possible. The actors stay in character whether they are running off in the distance or marching onto the “stage”. Every thread in the finished work is held tightly together—that definitely includes the costumes by Jessa-Raye Court which are superb. Never before had I experienced Shakespeare in Central Park and this production of A Midsummer Night’s Dream ushered me in to a new experience with an entertaining bang. I felt like a child being exposed to the theater all over again and the kicker is the entire event is free. Yes, F.R.E.E. I can’t tell you how many soul crushing performances I have witnessed in my day and had to pay on top of it. In all, watching A Midsummer Night’s Dream in the Central Park was great way to start my summer and it should be something you add to your “to see list” this summer. You can watch A Midsummer Night’s Dream every Saturday and Sunday at 2pm (except 4th of July weekend). Location: Between 69th and 72nd Street entrances by Central Park West. The spot is closer to 71st. With: Caleb Carlson (Theseus, Duke of Athens), Cassandra Johnstone (Hippolyta, Queen of the Amazons), Barbara Drum Sullivan (Philostrate), Uriel Menson (Egeus, father of Hermia), Laura Darrel (Hermia), Bret Richard Hoskins (Lysander), Spencer Scott (Demetrius), Kristin Patton (Helena), Vinne Penna (Bottom), R. David Robinson (Quince), Edgar Equia (Snug/fairy attendant), Dan Lovely (Snout/fairy attendant), Jeff Burchfield (Starveling/fairy attendant), Miles Butler (Flute), Scott Michael Morales (Puck), William John Austin (Oberon), Annalisa Loeffler (Titania), Adriana Jones (Lavender),Danielle Demisay (Assistant Director), Sarah Lahue (Stage Manager), Kathryn Meister (Assistant Stage Manager), Jessa-Raye (Maxine Preston (Costume Assistant), Ashley McDonald (Costume Assistant), Antonio Minio KampfirePR (Press agent), Stefano Imbert (Illustrations) and Zennie Trieu (Development Intern). Jervelle Frederick is a graduate of the Fame School (LaGuardia High School) where he studied music and took part in performances such as Hairspray as well as numerous Choral Concerts. At the age of fifteen Frederick made his Carnegie Hall debut with one of New York’s elite choirs Collegiate Choral. In October of 2010 Frederick returned to the Carnegie Hall stage to perform the New York premier of Rock Concerto by Alexander Markov.Carnegie Hall once again welcomed Frederick and the Collegiate Choral in April 2012 to perform The Mikado. In May 2011 he worked with Grammy Award winning jazz musician Arturo O’Farrill as a chorus member and gospel soloist featured in the premier of his piece “Still Small Voice” at Symphony Space. In 2011 Frederick started and finished his first novel and screen play. He has since been a mentee of Michael Mejias (Front Desk Administrator at Writers House/Playwright) and is working towards his debut novel. In the summer of 2013 he aided Mejias as the production intern of his play Ghetto Babylon at 59E59 Theaters. Frederick currently studies journalism at Long Island University and writes for Seawanhaka (The school paper). He recently earned an interning position at Ebony Magazine. Join our mailing list to receive the latest news and updates from our reviewers. Want our reviews delivered to your inbox? Join our mailing list to receive the latest reviews from the Front Row Center. We will email you all of the reviews twice weekly.